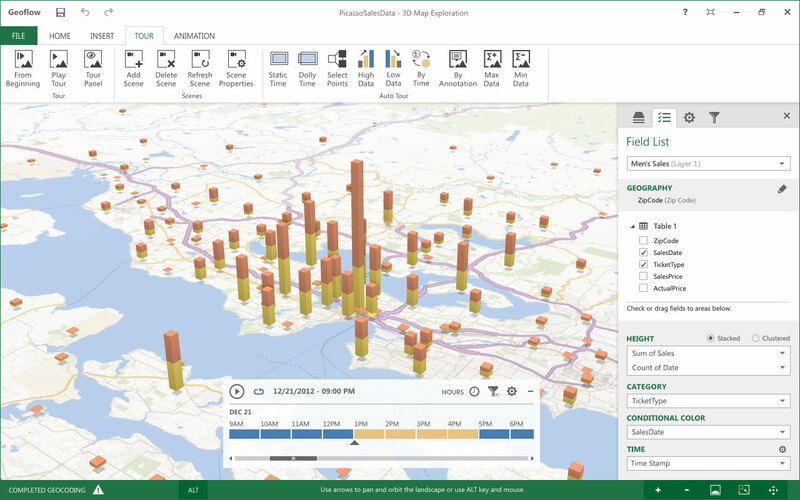 Growing out of the Worldwide Telescope project from Microsoft Research, Power Map looked to build an accessible data visualization tool that could would allow customers to look at information in new ways. I led the initial visual and interaction design work, helping to explore and develop user-centric solutions as we built a new medium for storytelling through analytics. With many projects in SBG (Small Business Group), the technology drives the interest but the user experience solidifies the product. The team needed a steady hand. One that could deliver cohesive vision covering interaction and visual design to transform the concept from a good idea to friendly and usable product. We built the first 3D data visualization product that could allow users to tell stories. 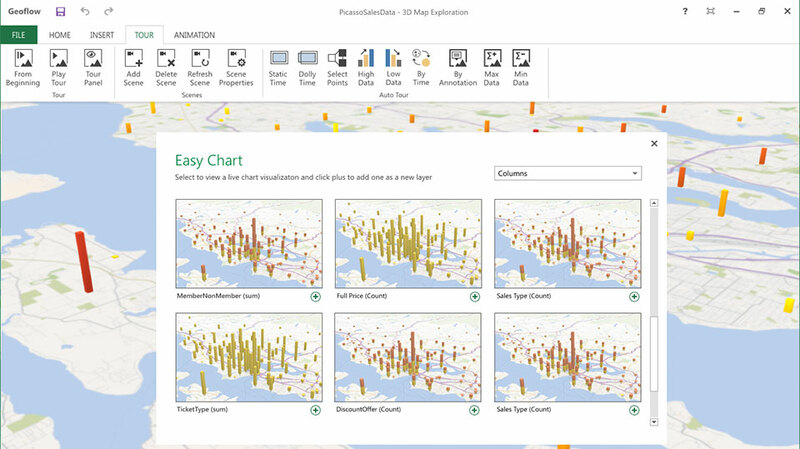 It enabled users to contextualize data to geographic locations and visualize that over a duration of time. 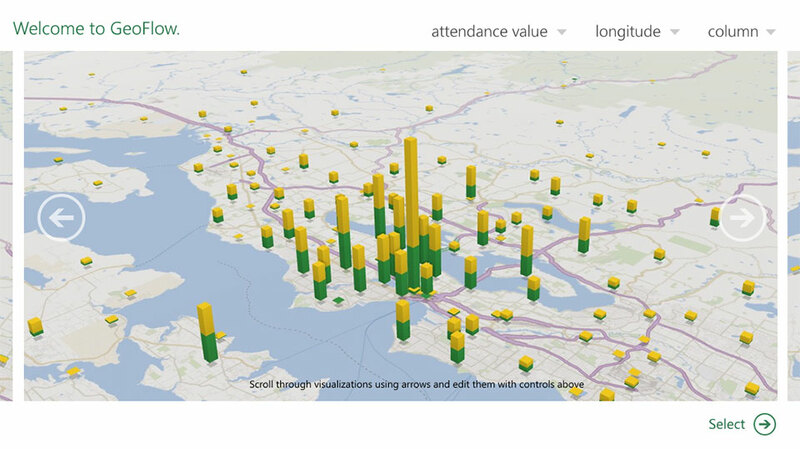 Power Map features were eventually integrated into the Power BI product around 2014-2015. 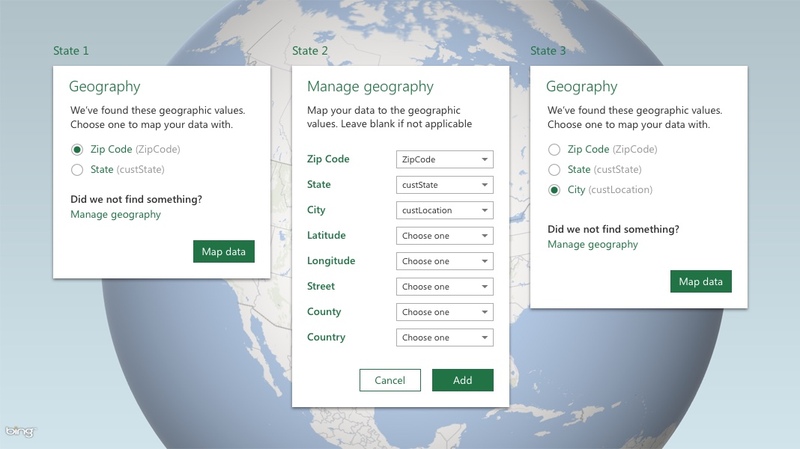 One of my first challenges on the Power Map team was to analyze and deliver recommendations for improving the experience of selecting the initial geographic category to render on the map. 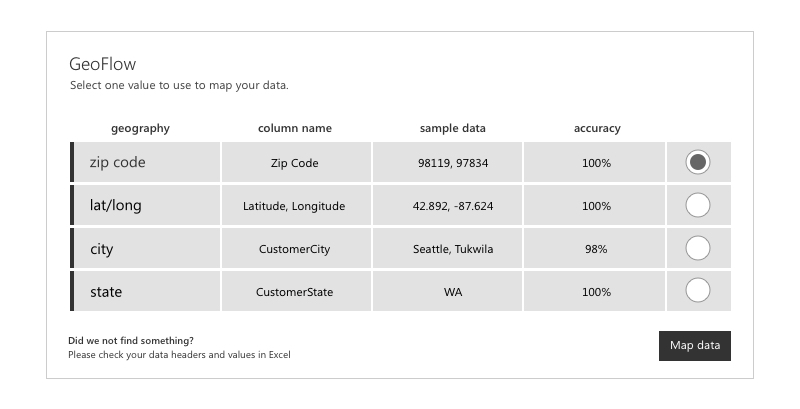 The current experience was bare bones, bringing in every column of data the imported table included. This had led our alpha users astray thinking they could select any category for visualization and team needed a way forward to improve the experience. At this point we had not thought to parse or clean the data to isolate what we thought were geographic data and present the users with focused, limited choices to choose from. The last example was the preferred direction with our customers. The feature was included in our next release and immediately improved our users ability to correctly select a value to map. (left) - Initial version of the geography selection. 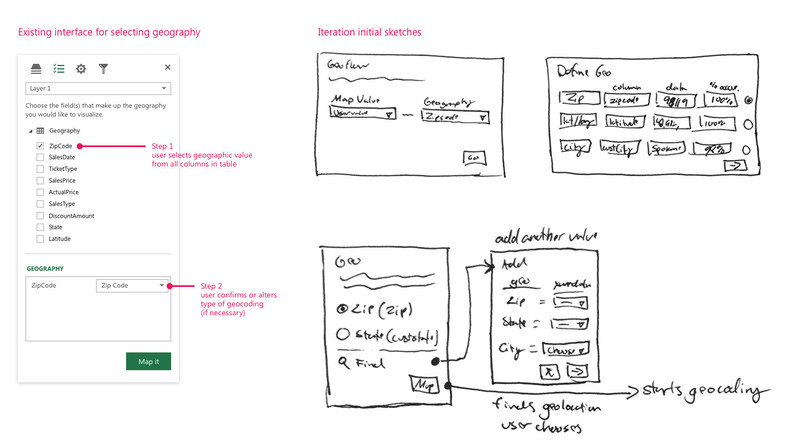 (right) Preliminary sketches of alternate approaches. After testing, this version was implemented in the beta application. In addition to the prior work, I also pitched some blue-sky concepts for the initial step that we evaluated with our customers. They tested favorably, but needed many more resources and time we didn't have available. 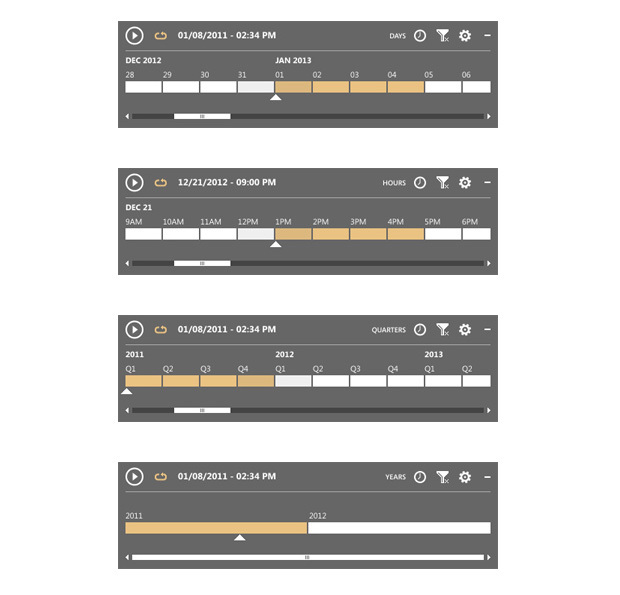 These concepts sought to explore a highly visual interface on startup to give users an instant view as an alternative to the primary method of visualizing data. In addition to my UX responsibilities, I also led the design of the visual direction for the beta product. This included creating our ribbon icons and developing unique and patterned styles for various controls, map overlay visualizations and application shell elements. Initial direction for the ribbon icons for the beta release. The playback control UI I developed. It allowed user various functions including modifying the span of time in view.